Hammer And Cyclery was just a conversation in 2009. 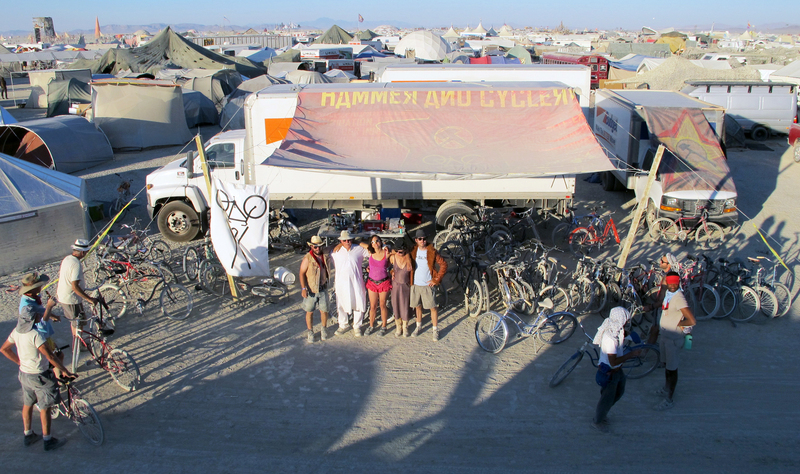 We brought our first tools to the Playa in 2010. Two of us drove 50 bicycles out to the Playa from Minneapolis and joined DropIt LikeIts Hott Spot on Edinburgh and 3:30. In 2011 we became our own Placed camp and the effort was Christened Hammer And Cyclery. We drove 200 bikes across the country to 3:30 and Anniversary and I must say it was a smashing success. We learned a lot (I lost 15 pounds), but we are still going strong today. We are still a growing camp, but our crew hosts almost 10,000 interactions each year, most of which are ONE ON ONE! We have many professional mechanics, apprentice mechanics, and other volunteers covering our work shifts every day. Hammer And Cyclery really is a community effort.